Ten Speed Press, 9781580087575, 224pp. You don't need to own a car to live well in America. In fact, you'd probably be better off without one. In this groundbreaking guide, award-winning journalist Chris Balish exposes the true costs of car ownership and shows how car-free living can put anyone on the path to financial freedom. Using the book's car cost worksheet, first figure out how much owning a car really costs-you'll be surprised. Then, see how easy it is to transition to a car-free or car-lite lifestyle using Chris's strategies for commuting, running errands, taking trips, dating, socializing, and more. You'll also find hundreds of tips and success stories from car-free people in cities and suburbs across America. Without car payments, rising gas prices, and traffic jams to worry about, you'll have more money and leisure time to spend as you choose. Discover why getting rid of your car may be the soundest and sanest lifestyle change you can make. "Chris Balish offers a mix of the practical-a worksheet to figure out a car's total cost and impact-as well as the horrifying: The average American walks just 300 yards a day." "If ever there was a practical inducement to get out of the car trap, this is it. For the multitude of Americans stuck in traffic and spending thousands of dollars a year on their cars, Chris's lively and pragmatic step-by-step solutions provide a way out." "Chris Balish's book can help environmentally conscious Americans live their values. If you're concerned about pollution and global warming, follow the program in these pages. There can be life without a car. And a good life at that!" "[Chris Balish's] prescriptions are feasible and most important, reasonable." 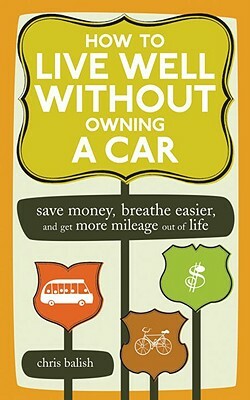 "Even if living car-free or car-lite isn't for you, you'll still learn a lot from this book. I did." Listen to Chris Balish talk about living car-free in Los Angeles on NPR's Morning Edition. Chris Balish is an award-winning feature writer, reporter, and broadcast journalist. He began his writing career working for Writer’s Digest magazine and Writer’s Digest Books. Since 1995 he has been a full-time reporter and television news anchor. Chris is the recipient of nearly thirty awards for excellence in journalism and writing, including six regional Emmy Awards. He is a graduate of Dartmouth College in Hanover, New Hampshire. But most important, Chris is passionate about how going car-free improved his life and how it can improve the lives of others. He commutes by bicycle year-round and travels all over on foot, on mass transit, and by carpooling with friends, girlfriends, and coworkers. Chris is single and has a vibrant car-free dating and social life.